Rencana ini memerlukan kemaskini dalam Bahasa Melayu piawai Dewan Bahasa dan Pustaka. Sila membantu, bahan-bahan boleh didapati di List of largest empires (Inggeris). Empayar melibatkan perluasan kedaulatan sebuah negara ke atas wilayah luar. Sebagai contoh, dahulu Empayar Sepanyol dan kemudian Empayar British dipanggil dengan "Empayar di mana matahari tidak pernah terbenam", di sebabkan wilayahnya di seluruh dunia. Rencana ini menyediakan satu senarai empayar terbesar di dalam sejarah dunia. Peta anachronous bagi Empayar Sepanyol di luar negara (warna merah). Untuk perhatian, jumlah keluasan tanah di Bumi kurang sedikit daripada 149 juta km2. Berikut adalah empayar-empayar yang memecah rekod saiz pada zamannya, setiap satunya memiliki luas yang lebih besar (atau menyamai) dengan empayar pemegang rekod sebelumnya. 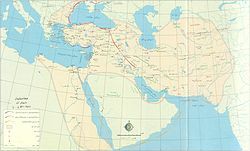 Empayar Achaemenid at its greatest extent. Empayar Macedon at its greatest extent. Empayar Maurya at its greatest extent. Empayar Mongol at its greatest extent. 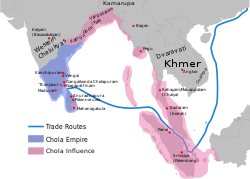 Empayar British at its greatest extent. Empayar Rusia at its greatest extent. 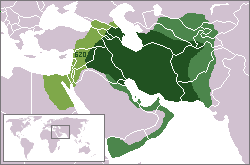 Empayar Sepanyol at its greatest extent. Anachronous map of the Empayar Portugal. 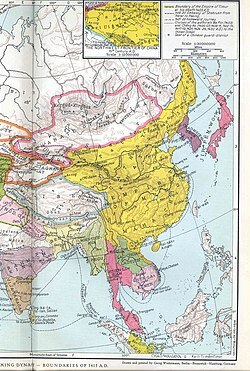 Empayar Qing at its greatest extent. Empayar Uthmaniyyah territories acquired between 1300 and 1683. 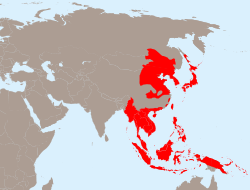 Empire of Japan at its greatest extent. Empayar Qing, China - 432.2 juta in 1851. Ming Empire, China - 110.0 juta in 1600. Yuan Khanate - 86.0 juta in 1290. Southern Song Dynasty, China - 73.0 juta in 1193. Empayar Belanda - 60.0 juta in 1940. Jin Dynasty, China - 48.0 juta in 1195. Empayar Achaemenid in the 5th century SM. KDNK dianggarkan di dalam senarai berikut diberi kepada empayar pada zaman moden, bermula pada kurun ke-18 sehingga ke-20. Jumlah nilai dolar Amerika berdasarkan nilai pada tahun 1990. ^ CIA - The World Factbook(The total is 148.94). ^ a b c d e f g h i j k l m n o p q r s t u v w x y z aa ab ac ad ae af ag ah ai aj ak al am an ao ap aq ar as at au av aw ax ay az ba bb bc bd be bf bg bh bi bj bk bl bm bn bo bp bq br bs bt bu bv bw bx by bz ca cb cc cd ce cf cg ch ci cj ck cl cm cn co cp cq cr cs ct cu cv cw cx cy cz da db dc dd de df dg dh di dj dk dl dm dn do dp dq dr ds dt du dv dw dx dy dz ea eb ec ed ee ef eg eh ei ej ek el em en eo ep eq er es et eu ev ew ex ey ez fa fb fc fd fe ff fg fh fi fj fk fl fm fn fo fp fq fr fs ft fu fv fw fx fy Peter Turchin, Thomas D. Hall and Jonathan M. Adams, "East-West Orientation of Historical Empires", Journal of World-Systems Research Vol. 12 (no. 2), pp. 219-229 (2006). ^ a b c d e f g h i j k l m n o p q r s t u v w x y z aa ab ac ad ae af ag ah ai aj ak al am an ao ap aq ar as at au av aw ax ay az ba bb bc bd be bf bg bh bi bj bk bl bm bn bo bp bq br bs bt bu bv bw bx by bz ca cb cc cd ce cf cg ch ci cj ck cl cm cn co cp cq cr cs ct cu cv cw cx cy cz da db dc dd de df dg dh di dj dk dl dm dn do dp dq dr ds dt du dv dw dx dy dz ea eb ec ed ee ef eg eh ei ej ek el em en eo ep eq er es et eu ev ew ex ey ez fa fb fc fd fe ff fg fh fi fj fk fl fm fn fo fp fq fr fs ft fu fv fw fx fy fz ga gb gc gd ge gf gg gh gi gj gk gl gm gn go gp gq gr gs gt gu gv gw gx gy gz ha Rein Taagepera "Expansion and Contraction Patterns of Large Polities: Context for Russia", International Studies Quarterly Vol. 41, 475-504 (1997). ^ a b c d Blankinship, Khalid Yahya (1994). The End of the Jihad State, the Reign of Hisham Ibn 'Abd-al Malik and the collapse of the Umayyads. State University of New York Press. m/s. 37. ISBN 0791418278. ^ a b c d Vasseghi, Sheda, "The other Iran story: Re-engineering the nation's cultural DNA", Breaking... WorldTribune.com World Tribune News, (12 October 2009). ^ a b c Steele, Christy, "Rome", p. 36 (2001). ^ a b c d e f g h i j k l m n o p q r s t u v w x y z aa ab ac ad ae af ag ah ai aj ak al am an ao ap aq ar as at au av aw ax ay az ba bb bc bd be bf bg bh bi bj bk bl bm bn bo bp bq br bs bt bu bv bw bx by bz ca cb cc cd ce cf cg ch ci cj ck cl cm cn co cp cq cr cs ct cu cv cw cx cy cz da db dc dd de df dg dh di dj dk dl dm dn do dp dq dr ds dt du dv dw dx dy dz ea eb ec ed ee ef eg eh ei ej ek el em en eo ep eq er es Rein Taagepera "Size and Duration of Empires: Growth-Decline Curves, 600 B.C. to 600 A.D.", Social Science History Vol. 3, 115-138 (1979). ^ a b c d e f g h i j k l m n o p q r s t u v w x y z aa ab ac ad ae af ag ah ai aj ak al am an ao ap aq ar as at au av aw ax ay az ba bb bc bd be bf bg bh bi bj bk bl bm bn bo bp bq br bs bt bu bv bw bx by bz ca cb cc cd ce cf cg ch ci cj ck cl cm cn co cp cq cr cs ct cu cv cw cx cy cz da db dc dd de df dg Rein Taagepera "Size and Duration of Empires Growth-Decline Curves, 3000 to 600 B.C. ", Social Science Research Vol. 7, 180-196 (1978). ^ a b c Claudio Cioffi-Revilla, J. Daniel Rogers, Steven P. Wilcox, & Jai Alterman, "Computing the Steppes: Data Analysis for Agent-Based Modeling of Polities in Inner Asia", Proceedings of the 104th Annual Meeting of the Amer. Pol. Sci. Assoc., Boston, MA, p. 8 August 28–31, (2008). ^ a b c d e f Rein Taagepera "Size and Duration of Empires: Systematics of Size", Social Science Research Vol. 7, 108-127 (1978). ^ a b c John O. Hunwick: Timbuktu and the Songahy Empire: Al-Sa’di’s Ta’rikh Al-sudan Down to 1613 and other Contemporary Documents (Brill, 2003),p. xlix. ^ a b c Ferguson 2004, p. 15. ^ Stewart, Basil, "Restoration of Palestine", (In reference to the Empayar Achaemenid), p. 3 (2003). ^ Parker, Philip, "The Empire Stops Here", p. 2 (2009). ^ Peak area estimated by Taagepera (1979) is 3.4 juta km2 pada 261 SM. ^ Peak area estimated by Taagepera (1979) and Turchin et al (2006) is 9.0 juta km2 pada 176 SM. As it should be noted, historians are divided on whether the Xiongnu was an empire, and modern consensus in the majority of reputable sources is that the Xiongnu did not exceed 5 juta km2 at their greatest extent. ^ Peak area estimated by Turchin et al (2006) is 2.0 juta km2 pada AD 140. ^ Peak area estimated by Taagepera (1979) is 1.7 juta km2 pada AD 440. ^ Peak area estimated by Turchin et al (2006) is 2.3 juta km2 in 1210. ^ Peak area estimated by Turchin et al (2006) is 1.0 juta km2 in 1120. ^ Peak area estimated by Taagepera (1997) is 1.0 juta km2 in 900. ^ Peak area estimated by Taagepera (1997) is 1.7 juta km2 in 1200. ^ Peak area estimated by Taagepera (1997) is 1.0 juta km2 in 1130. ^ Peak area estimated by Taagepera (1997) is 1.6 juta km2 in 1400. ^ Peak area estimated by Taagepera (1997) is 1.5 juta km2 in 1163. ^ Peak area estimated by Taagepera (1997) is 35.5 juta km2 in 1920. ^ Peak area estimated by Taagepera (1997) is 13.7 juta km2 in 1780 or 1810. ^ Peak area estimated by Taagepera (1997) is 12.3 juta km2 in 1920. ^ Peak area estimated by Taagepera (1997) is 5.5 juta km2 in 1820. ^ "Mexican Empire". All Empires. Dicapai 2009-08-02. ^ a b c d e f g h i Harrison (1998, pp. 3,7). ^ a b c d e f g h (a) John D. Durand, 1960, "The Population Statistics of China, A.D. 2–1953," Population Studies Vol. 13 (No. 3), 209–256. (b) John D. Durand, 1974, "Historical Estimates of World Population: An Evaluation," University of Pennsylvania, Population Center, Analytical and Technical Reports, Number 10. ^ The combined population of China and Korea in the 13th century was 83 juta in Biraben (2003Templat:Page number). The combined population of Eropah Timur, Rusia, Asia Tengah, Iran, Iraq dan Turki was about 27 juta in Maddison (2006Templat:Page number). ^ There are several different estimates for the Empayar Rom. Scheidel (2006, p. 2) estimates 60 juta. Goldsmith (1984, p. 263) estimates 55 juta. Beloch (1886, p. 507) estimates 54 juta. Maddison (2006, p. 51, 120) estimates 48 juta. Roman Empire Population estimates 65 juta (while mentioning several other estimates between 55 juta and 120 juta). ^ The combined population of Spain, Portugal, Italy, Netherlands, United States and the Philippines was 29.2 juta in Maddison (2006Templat:Page number). The population of Latin America was 39 juta in Biraben (2003Templat:Page number), minus Brazil and its 4 juta people with was a part of the Empayar Portugal. ^ The combined population of Southwest Asia and North Africa was about 57 juta in Biraben (2003Templat:Page number). The combined population of Spain and Portugal was about 5 juta in Maddison (2006Templat:Page number). ^ Recorded number of persons and households in 755 are 52,919,309 and 8,914,709, respectively (Book of Tang). ^ a b While estimates for the Empayar Achaemenid range from 10–80+ juta, most prefer 50 juta. Prevas (2009, p. 14) estimates 10 juta 1. Langer (2001, p. 40) estimates around 16 juta 2. McEvedy and Jones (2001, p. 50) estimates 17 juta 3. Strauss (2004, p. 37) estimates about 20 juta 4. Ward (2009, p. 16) estimates at 20 juta 5. Aperghis (2007, p. 311) estimates 32 juta 6. Scheidel (2009, p. 99) estimates 35 juta 7. Zeinert (1996, p. 32) estimates 40 juta 8. Rawlinson and Schauffler (1898, p. 270) estimates possibly 50 juta 9. Astor (1899, p. 56) estimates almost 50 juta 10. Lissner (1961, p. 111) estimates probably 50 juta 11. Milns (1968, p. 51) estimates some 50 juta 12. Hershlag (1980, p. 140) estimates nearly 50 juta 13. Yarshater (1996, p. 47) estimates by 50 juta 14. Daniel (2001, p. 41) estimates at 50 juta 15. Meyer and Andreades (2004, p. 58) estimates to 50 juta 16. Pollack (2004, p. 7) estimates about 50 juta 17. Jones (2004, p. 8) estimates over 50 juta 18. Safire (2007, p. 627) estimates in 50 juta 19. Dougherty (2009, p. 6) estimates about 70 juta 20. Richard (2008, p. 34) estimates nearly 70 juta 21. Mitchell (2004, p. 16) estimates over 70 juta 22. Hanson (2001, p. 32) estimates almost 75 juta 23. West (1913, p. 85) estimates about 75 juta 24. Zenos (1889, p. 2) estimates exactly 75 juta 25. Cowley (1999 and 2001, p. 17) estimates possibly 80 juta 26. Cook (1904, p. 277) estimates exactly 80 juta 27. ^ a b McEvedy and Jones (1978). ^ a b c d e f g h i j k l m n o p q r s Maddison, op cit. For alternate estimates, see the Economic History Services' USA/UK KDNK search tool. ^ a b Broadberry and Harrison (2005). Hempstone, Smith (2007). Africa, Angry Young Giant. Whitefish: Kessinger Publishing, LLC. m/s. 664 pages. ISBN 0-54844-300-9. Stephen Broadberry and Mark Harrison (2005). The Economics of World War I. Cambridge University Press. ISBN 0-521-8521-2-9. Ferguson, Niall (2004). Colossus: The Price of America's Empire. Penguin. ISBN 1594200130. Sevket Pamuk (2005), "The Ottoman Empire in World War I". In Stephen Broadberry and Mark Harrison (2005), The Economics of World War I, p. 112-136. Cambridge University Press. ISBN 0-521-8521-2-9. K. A. Nilakanta Sastri. (1935)"The Cholas"" University of Madras. Laman ini diubah buat kali terakhir pada 00:25, 26 Mac 2018.